Anyone who has enjoyed the pleasure of a cold brew coffee knows that something is very special about it. Perhaps its the smoothness of the drink or that it’s a refreshing caffeinated drink. Maybe it’s just the fact that it’s the perfect combination of sweetness and milkiness. Whatever the reason for its popularity, the fact of the matter is that more and more people are discovering this tasty treat. Of course, making a perfect cold brew requires a number of things to come together in just the right way. It requires the right setup, the right brewing procedure, and the right coffee. That’s why we’ve researched the best coffees for a cold brew and listed them below. And along with those coffees, we’ve provided a guide which will enable our readers to make the best cold brew Java possible. This coarsely-ground dark roast coffee has a pretty good flavor profile and makes a low-acid coffee that’s definitely gentle on the pallet. It has hints of chocolate and toffee and comes in 2-pound bags that are easy to handle and use. This company uses USDA certified organic beans, and this grind is Fair Trade and Kosher Certified coffee. It’s a decent coffee that makes a tasty cold brew, especially when it’s made correctly using a slow filtering process. This Tiny Footprint coffee is not only specially ground and roasted for cold brew elixirs, but it is also a carbon negative coffee. What does that mean? That means that this company plants trees with every bag of coffee purchased, so coffee lovers can feel good about not only drinking a fine iced coffee but also helping the environment. This blend is made from organic shade-grown Arabic beans, but its grind is a little more inconsistent that we would’ve liked. Even so, it still managed to make a tasty cold brew that we really enjoyed. 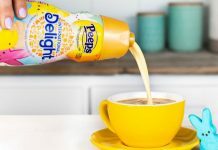 Although this coffee makes a brew that may be too mild for some palettes—meaning it might fade into the background when creamers or syrups are added to it, this product still has an interesting taste profile. In fact, it’s probably one of the more interesting flavor combinations we’ve found in a coffee blend. 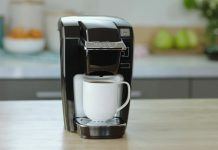 This medium-roast coffee would be a coffee that’s not only good for cold elixirs but is pretty good for drip-style coffee makers. All of which makes it a decent coffee. Although this product is specifically grown, roasted and ground for French press coffees, we have to say that it does make a mighty fine cold brew. It makes an elixir that isn’t too weak and isn’t too strong but has just the right combination of acidity and mellowness. Its low acid flavor has citrus and nutty notes in it, and it makes a fine cold coffee that’s certainly easy to drink. What makes this coffee pretty exceptional is that they’ve created a unique cold coffee flavor profile by blending medium and dark roasted beans. They then take this proprietary blend of roasted beans and gives them an extremely coarse grind. This allows it to make an excelled cold coffee that’s smooth and flavorful but is also bold as well. It may be a little bit pricey, but it is delicious and will probably make quite a few cold coffee fans happy. This Grady’s DIY kit is designed to make the cold brew coffee making process just about fool-proof. In its pouch, this coffee contains ground coffee beans, spices, and chicory that just needs a little bit of water to activate. The water soaks overnight and dispenses straight from the bag if so desired. And when the coffee drinker is done with the bag, they can discard it or compost it. It makes a tasty New Orleans coffee that can’t be beaten, although we do have to say it’s a bit expensive when compared to making your own cold brew. This 100% organic coarsely ground coffee is designed specifically to be used in cold brews and it shows in the end product. Although it may be a little strong for some palettes, it does have a smooth, sweet finish that’s sure to delight other people. It’s made using ethically sourced beans from Peru and Nicaragua and thanks to its uniform grind it makes a consistent brew each and every time it’s brewed. This dark roasted coffee is made from USDA certified Organic coffee that meets Fairtrade Coffee Standards and has a bold flavor profile to it. When made into a hot coffee, these dark roast coffee grounds make a cup of coffee that has some kick. However, when they’re made into a cold brew, they seem to become something more than just a highly caffeinated coffee. That’s because they have a unique flavor profile that makes them ideal for cold brews. Packaged in a 1-pound resealable bag and ground right before packaging, this coffee is as fresh as you can get without grinding it yourself. It has a nice flavor profile that’s not too strong or too mild, and its perfect grind size is ideal for making cold brew coffees. When brewed, this product creates a coffee that’s slightly sweet, has low acidity levels and is well balanced. It is definitely worth checking out by anyone who enjoys their coffee cold. This coffee is designed to be bold and extremely caffeinated so that everyone can start their day with a great cup of cold coffee. This medium roast coffee has a nice grind to it and makes a great cup of cold brew coffee. It’s made using the best Brazillian and Colombian coffee beans that make a coffee that just about anyone can love. Its aggressive flavor is one that will transform ordinary cold coffee into something that’s truly magnificent. Cold brew coffee is somewhat of a phenomenon. Every day millions of people head to their favorite coffee shop and enjoy one of these drinks. And why wouldn’t they? The combination of silky smoothness, creaminess and sweetness are enough to make just about anyone a fan. Unfortunately, most of these people are overpaying for these drinks by buying them at a coffee shop instead of making their own at home. Sure, we understand that there is a convenience factor to consider. When people buy a cold brew cup of Joe, they’re paying more money for convenience. However, the one thing that they aren’t paying for is taste. 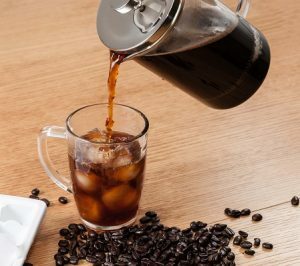 Once you’ve made your own cold brew coffee, you’ll soon realize that what most coffee shops sell isn’t all that good and that you can make a better product at home with the right tools and a little bit of know how. Let us show you how with this guide. Before you can make the best cold brew coffee possible, you first have to understand the definition of this coffee drink. Cold brew coffee is defined as any coffee that’s brewed at room temperature or using cold water over a 12 to a 24-hour time frame. 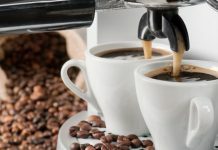 Coffees made in this way tend to have a more mellow flavor and tend to have less acid. And this combination makes this coffee perfect for cold drinks. Okay, now that we’ve defined what a cold brew coffee is, it’s time to talk about making the best one possible. Although this type of coffee can be made in several different ways, our favorite method of making it is the one below. So, let’s go ahead and get started. The first thing that you’ll want to do is make sure that you purchase the best cold brew coffee blends available. A coffee blend that’s strong enough to stand up to the mellowing process of cold brewing, all the while having a flavor profile that makes it stand out from the crowd. In our opinion, that means purchasing a medium or dark roast coffee for cold brewing. If you prefer, you can buy whole beans and grind themselves, or you can purchase a pre-ground coffee. Regardless of whether you choose to grind your own beans or not, it’s important to remember that the grounds should be coarsely ground for best results. Another way to make great cold brew coffee is to use purified water. A lot of guides skip this step, but it’s extremely important. The best way to do it is to filter it through one of those carbon filter pitchers and set it aside in a clean pitcher. You’ll also want to get together some of the supplies you’ll need. Since we’re grinding our own beans for our brew, we’re going to need 8-ounces of beans and a coffee bean grinder. However, if you use a pre-ground coffee, then you obviously don’t need the grinder and can just use 8-ounces of coffee grounds instead. Below are some items you’ll going to need. Now that we’ve purified our water and have all of our equipment together, all that’s we need to do is put it together, so let’s get right into it. Grind The Beans: Grind your beans into a coarse-grind or grab your coarsely ground beans and have them available. Combine The Water & Coffee: Place the coffee grounds into your 3-quart pitcher, and add the purified water. Stir the ingredients: Stir the coffee/water mixture with your wooden spoon or chopstick. Make sure that all of the coffee is wet. Steep In The Fridge: Place the pitcher in your refrigerator and wait anywhere from 12 to 24-hours. Strain The Mixture: Setup your fine-mesh strainer with a cheesecloth, and set it over a bowl. Now slowly pour the mixture through the cheesecloth. This step takes some time, and will usually have to be done in batches, depending on your setup. Don’t rush this process by trying to wring out the grounds, just let it slowly drip through. Put The Coffee Into A Clean Pitcher: As your bowl fills, transfer the contents to your clean pitcher. Once it’s filled, you can put a lid on it and keep it for up to 2-weeks. Enjoy Your Cold Brew Coffee: Now add it to a cup with some ice and your favorite flavorings. Make sure to set some time aside to savor your creation.